Demand for the iPhone 5s appears to be outstripping supply, as shipping times for the high-end iPhone have slipped to seven to ten business days at Apple's online store, while the gold model appears to be completely out of stock. In Apple's online store, all models of the silver and space gray models of the iPhone 5s are listed with shipping times of between seven and ten business days. 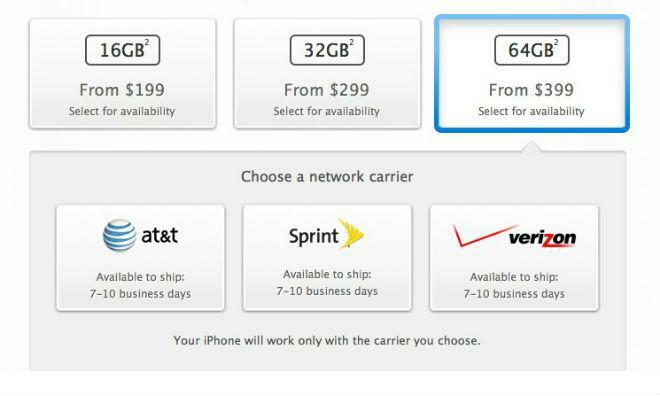 The shipping delay applies across AT&T, Sprint, Verizon, T-Mobile, and contract-free models. The gold iPhone 5s variant, however, appears to be completely out of stock for the time being. Apple's store lists all configurations of all models of the device as available to ship in October. Apple has confirmed the sell-outs in a statement. "Demand for the new iPhones has been incredible," an Apple representative told AllThingsD on Friday, "and we are currently sold out or have limited supply of certain iPhone 5s models in some stores. After months of speculation, hype, and anticipation, the newest generation of Apple's bestselling smartphone debuted on Friday to massive crowds at physical retail locations and an equally enthusiastic response online. The apparent quick exhaustion of 5s supplies may stem from low production yields of the device, those possibly driven by difficulties in producing the Touch ID fingerprint sensor Apple built into it. Supplies of the polycarbonate-backed iPhone 5c, however, appear to be greater. That device, which is essentially a slightly upgraded iPhone 5 in a new casing, is listed as shipping in one to three business days.